Web development has grown rapidly over the last decade, and there&apos;s a long list of frameworks to choose from when building your projects. A developer’s decision on what framework(s) to use for a project is usually influenced by a number of specific factors; one of which is the complexity of the framework in defining the separate tasks that make up that project. Django is a web framework of Python that simplifies common practices in web development. Django has you covered, from authentication to session management, it will save you loads of time. 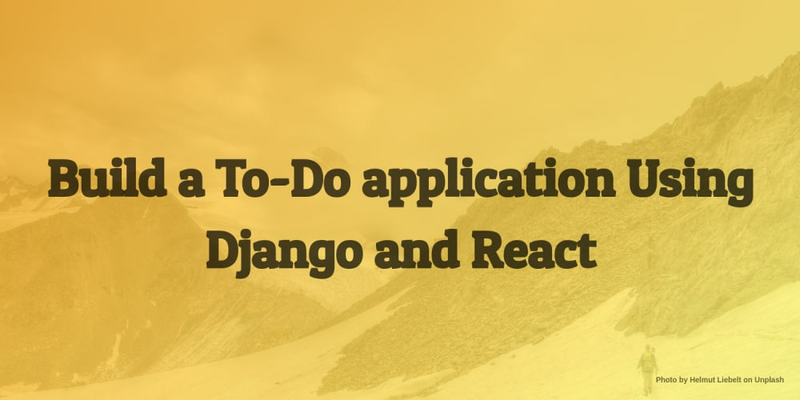 Django and React make an awesome combination to build this application with, owing to React’s SPA optimizations, and Django’s long list of helpful libraries. For this application to work correctly, the frontend (React) will have to interact with the backend i.e retrieve and store data. To create the interface for interaction, we will build an API (Application Programming Interface) on the backend, using the Django REST framework (DRF). Pipenv is a production-ready tool that aims to bring the best of all packaging worlds to the Python world. It harnesses Pipfile, pip, and virtualenv into one single command. Note: You should skip the first command if you already have Pipenv installed. We can test to see that CRUD operations work on the Todo model we created using the admin interface that Django provides out of the box, but first, we will do a little configuration. You will be prompted to enter a username, email and password for the superuser. Be sure to enter details that you can remember because you will need them to log in to the admin dashboard shortly. Awesome work so far, be proud of what you’ve done! In the next section, we will see how we can create the API using the Django REST framework. Django-cors-headers is a python library that will help in preventing the errors that we would normally get due to CORS. rules. In the CORS_ORIGIN_WHITELIST snippet, we whitelisted localhost:3000 because we want the frontend (which will be served on that port) of the application to interact with the API. Open the serializers.py file and update it with the following code. In the code snippet above, we specified the model to work with and the fields we want to be converted to JSON. The viewsets base class provides the implementation for CRUD operations by default, what we had to do was specify the serializer class and the query set. /todos/ - This returns a list of all the Todo items (Create and Read operations can be done here). /todos/id - this returns a single Todo item using the id primary key (Update and Delete operations can be done here). That’s all for the backend of the application, now we can move on to fleshing out the frontend. We have our backend running as it should, now we will create our frontend and make it communicate with the backend over the interface that we created. Note: If you don’t have Yarn installed, you can find installation instructions here. this.state.viewCompleted ? "completed-todo" : ""
Okay, that’s a lot of code , but there’s no need to be afraid now, we haven’t started interacting with the backend API, so we included default values to populate the Todo list. The `renderTabList()` function renders two spans which help control which set of items are displayed i.e clicking on the completed tab shows completed tasks and the same for the incomplete tab. To handle actions such as adding and editing tasks, we will use a modal, so let&apos;s create a Modal component in a components folder. These are the same fields that we defined as properties on the Todo model in the backend. Here’s how the CustomModal works, it receives activeItem, toggle and onSave as props. activeItem represents the Todo item to be edited. toggle is a function used to control the Modal’s state i.e open or close the modal. onSave is a function that is called to save the edited values of the Todo item. If we attempt to edit and save a Todo item, we will get an alert showing the Todo item’s object. Clicking on save, and delete will perform the fitting actions on the Todo item. Note: This command has to be run in the `backend` directory in a virtual Pipenv shell. Note: You might need to restart the development server for the proxy to register with the application. We will modify the frontend/src/App.js one last time so that it doesn’t use the hardcoded items from the array anymore, but requests data from the backend server and lists them instead. We want to also ensure that all CRUD operations send requests to the backend server instead of interacting with the dummy data. The refreshList() function is reusable that is called each time an API request is completed. It updates the Todo list to display the most recent list of added items. The handleSubmit() function takes care of both the create and update operations. If the item passed as the parameter doesn’t have an id, then it has probably not been created, so the function creates it. Congratulations! We have just built the fontend successfully. We’ve come to the end of this tutorial and learnt how to configure Django and React to interact correctly with each other. We also saw some of the benefits that come with bootstrapping a React application using the create-react-app tool, such as Hot-reloading which is basically the feature that makes it possible for the web app to reload on its own whenever a change is detected. When he is not writing code, learning a new framework or drafting a technical article, Jordan is playing a lead guitar with his rock band and making new music for the ears that appreciate sonorous sounds. He also does public speaking at tech meetups, and his theoretical knowledge from acquiring a BSc in Computer Science sometimes helps him in applying best practices while programming.